From all the different types of TV shows available during the years, medical series have been with us for an eternity, or at least that’s what it feels like. Wether they’re educational, covering technical aspects of intricate operations, or romanticised into stories about love, treason, career changes and friendship reconciliations, or even based around murderous crimes, they’re set in a medical environment where stress and tension will automatically lead to nerve-racking entertainment and drama. Let yourself be amazed, touched, inspired or shocked by this list filled with great stories by taking a look at the list of really good medical and doctor TV series on Netflix. Several of these shows are reality medical shows on Netflix. What is the opposite of a nurse healing a patient from whatever illness that has been laid upon him? 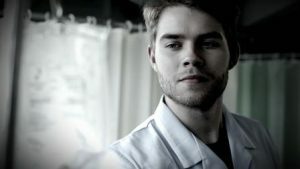 It’s a nurse killing a patient and leaving us wondering the mysterious and perhaps, unimaginable reason behind it. With medical, psychological and criminal experts around the table, “Nurses Who Kill” delivers a documentary series revolving around a set of murder cases, in which nurses have used their knowledge and position to end the life of one or more individuals. 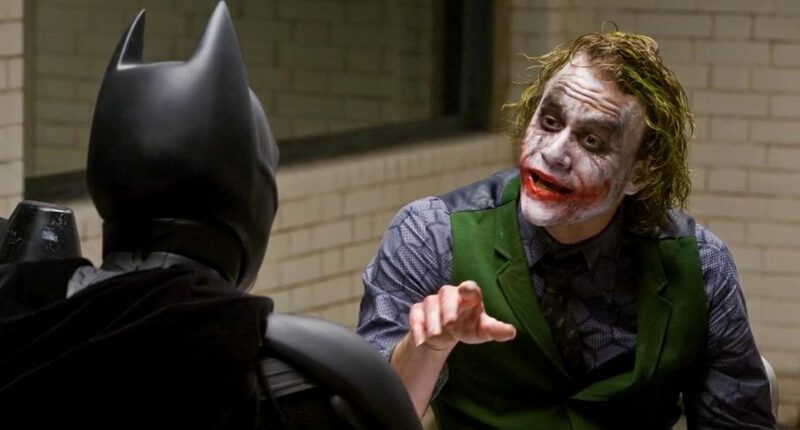 By analysing their possible motives, connections and the methods used for the final acts, we are given an informative peace of work that touches upon interesting and grabbing stories. For all the animal lovers out there who are interested in what goes on behind the medical curtains of a veterinary practice, this BBC tv show in the shape of a documentary series entails 1 season with 6 highly interesting episodes to be watched. 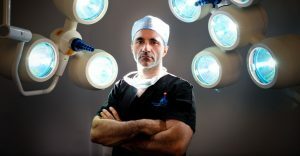 It focuses on the excellent work of Noel Fitzpatrick, an Irish veterinary surgeon living in Surrey, who pours his blood, sweat and tears in finding ingenious and innovative methods to save animals in critical conditions. Highly informative and moderately graphic throughout the medical procedures, it also engages the audience into an emotional connection to the animal’s fate, as one wishes for the best once the operation begins. 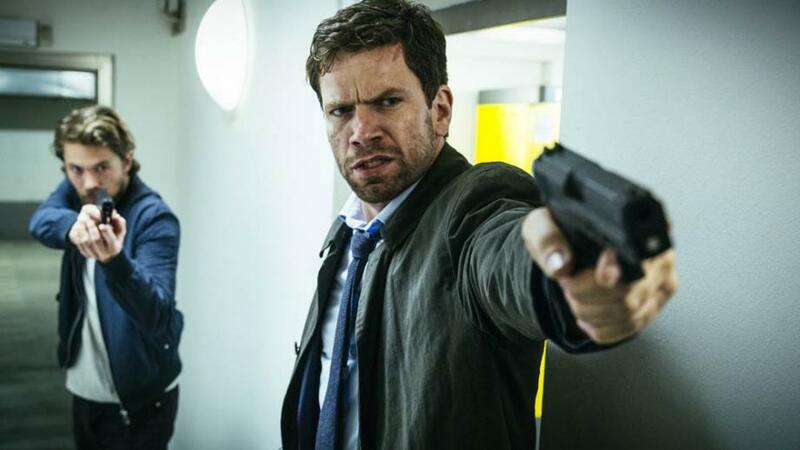 Let’s jump right into the criminal world where medical investigation solves the case with this Australian television program which offers numerous seasons of intriguing murder mysteries. It centres around Doctor Lucien Blake who has just come back to his native city of Ballarat, 60 miles away from Melbourne, after not having set foot in the country for more than 30 years. It’s the late 1950’s when he decides to take over his father’s practice and become the city’s police surgeon and general medical practitioner. That’s when the trouble starts and his help becomes crucial in leading law enforcement into the right direction to solve the horrendous murders happening around. We’ve probably realised by now that adults are not that different from teenagers after all. Even 10 years later, one can still face the same mocking drama and romantic rivalry that take us back to the years of hormonal adolescence. Here’s what you get with “Emily Owens M.D” : a medical tv show that takes a little bit of “Mean Girls” into its setting and plot and makes it a lighthearted and easy romantic comedy-drama for anyone wanting to leave the dark and heavy medical disasters at a distance. Emily has graduated from medical school and just begun her internship at a hospital, when she surprisingly notices that her medical-school crush and high-school enemy have landed in the same place as her. 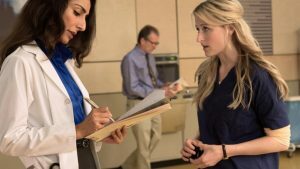 “Nurse Jackie” is a medical tv show that roams around an area of dark and pungent drama that counterbalances with its smartly topped hilarious and intelligent comedy. 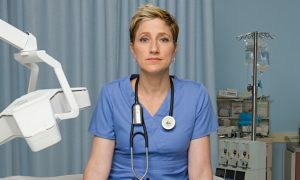 The show revolves around a strong and blunt emergency department nurse called Jackie Peyton, and the outstanding and solid performance of Edie Falco for the role. With intriguing well-written characters that push us to want to see more, the show revolves around the life-struggles of Jackie in balancing her work with her family and affair, all whilst hiding an addiction to pain killers. 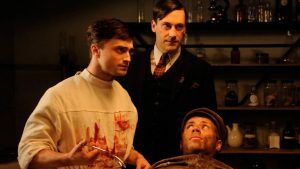 Starring Jon Hamm and Daniel Radcliffe, please welcome the next tv show to be filled in on your “to-watch” list. It’s a British dark comedy program where both talented actors perform the role of Dr. Vladimir Bomgard, the first being his older version and the second being his younger self, who with flashbacks will enable us to understand his past and the story moving the plot forward. Aside from romantic interest, complications and his significant use of morphine, the doctor spends his time trying to heal stubborn and difficult patients with the help of a team, at the Muryevo Hospital in Russia, in the early 20th Century. Well received by many, it is a safe choice for entertainment in the realms of medical tales. 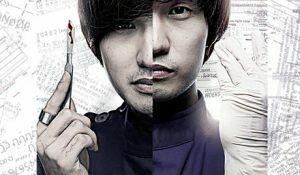 This time, it’s not an American or British tv show portraying the dramas of conflicted individuals inside the operation room or someone else’s bed, but a medical crime investigation drama from South Korea, with intrigue and mystery at its core. Also known as “God’s Quiz”, it’s easy to understand from its title that there will be puzzling enigmas arising throughout the various episodes of the show’s 4 seasons. The protagonist is bizarre Han Jin-woo, a brilliant neurosurgeon and forensic doctor at Hankuk University. Together with his team, he goes on complicated medical adventures solving rare and mysterious diseases with descriptive names we have never heard before and dubious deaths that seem to be hiding more than meets the eye. In the style of the medical drama “Grey’s Anatomy”, here’s a fresh approach on a similar type of setting where character must surpass the obstacles of life which can lead some to the top and misdirect others to the bottom. With four seasons waiting to be binge-watched, here’s a story filled with drama that will grab one’s attention until all needs of entertainment are satisfied to the last drop. With a set of characters backed up by great performances, we are brought into the chaotic world of San Antonio Memorial Hospital’s night shifts at the emergency room. There’s a rebellious former army-medic, a doctor trying to move up on the ranks-ladder, another dependent on his father’s fame and a lot of other character to get accustomed to on this medical adventure. Starring a group of wonderful and talented women, “Call The Midwife” is a successful period drama based on the memoirs of Jennifer Worth, a British nurse who had worked as a midwife in the East End of London during the late 1950’s and early 1960’s, the same place and time the tv show is set. Approaching a variety of important social issues such as abortion, poverty, miscarriages, homosexuality and many other themes, it is a beautifully written, performed and constructed series recounting the lives of a group of midwifes working in an underprivileged and poor area, where medical problems often arise and historical events eventually influence or not their every-day activities and working conditions. 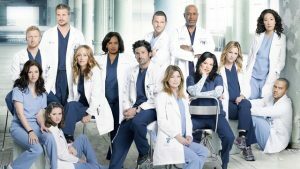 “Grey’s Anatomy” has been currently running for more than a decade and can be considered one of the most popular and well-known medical shows of the world. I’m sure everybody has heard of it and seen the face of actors such as Ellen Pompeo, Sandra Oh or Patrick Dempsey, even if just for a minute or two when turning the TV at prime time on. Having won numerous awards over the years and gathered an immense amount of loyal watchers, it is the second longest medical tv show of the world. Naturally, Netflix has to satisfy everyone’s desire for some iconic hospital drama and relationship twists with this story relating the ups and downs of the professional and personal life of a group of surgical interns and the people around them.